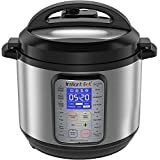 Instant Pot multi-use cookers are best-sellers during every major sales event on Amazon. People absolutely love these popular cookers, and it’s pretty obvious why. They’re incredibly useful, reliable, and precise cooking tools that make preparing your meals so much easier. Amazon had four different Instant Pot models on sale during Prime Day on Monday and Tuesday, and they were all quite popular among our readers. The bad news is all those deals are now sold out. But the good news is a new post-Prime Day deal just popped up on Amazon! The Instant Pot DUO Plus 60, 6 Qt 9-in-1 Multi- Use Programmable Pressure Cooker is well worth its $130 price tag, but you can snag one today for just $99.95. This deal will probably sell out as well, so grab one while you still can.